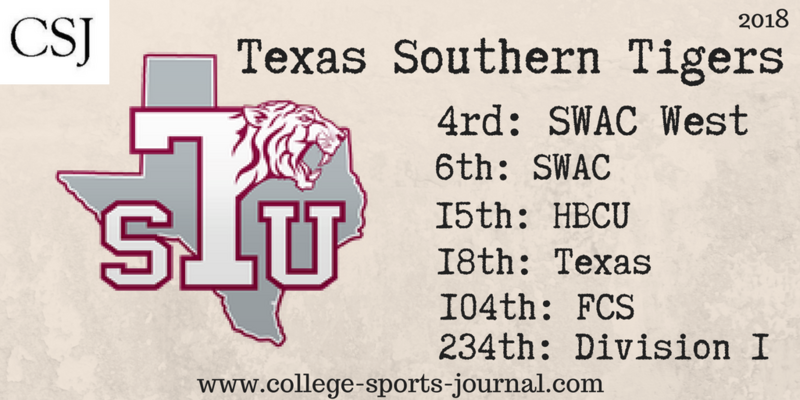 2017 In A Sentence: Texas Southern finished nearly last in the SWAC in all statistical categories that resulted in finishing just 2-9 overall and 2-5 in league play. Biggest Shoes to Fill: WR Darvin Kidsy was the team’s leading receiver last year with 37 receptions for 537 yards and given the team is unknown at the quarterback position (two possibilities of G5 Tulane transfer Glen Cuiellette and part time starter Dominic DeLira). Key Player: The Tigers should be headed on defense by a tackling machine in junior LB Julian Marcantel, who had 92 stops last year and added 8.5 of those for a loss. Fearless Prediction: With a number of transfers, the Tigers are a bit of an unknown how they will gel. But on paper, the Tigers should be better than the two wins they gained last year but middle of the SWAC West is probably as high as TSU will finish this year.